I heard this statement recently. Yes, some people think you have to have a brand. The reality is, though, you already have a brand. It’s not like you have no brand, and you are a slouch. It could be worse, actually. You might have a brand with negative consequences… that you are lazy, undependable, a grouch, etc. The pundits say you need a personal brand. I say you already have one. The question is, is your existing brand what you want it to be? In my $5,000 on-stage presentation I talk about having an intentional brand, one you purposefully work on, vs. having an unintentional brand. This is likely a brand you don’t know about, or a brand you aren’t happy with. I want you to understand that you already have a brand (whether you “need” one or not). And that if you are not happy with that brand, you can do things to make it a brand you could be happy about. The soundbite that stuck out was that about 60% of CEOs cited creativity as the most important leadership quality. This stood out to me for two reasons. First, I recently finished creating a Pluralsight course on how leaders can boost innovation in their teams. Really, this is a big fat course on how to be and think more creatively. Whether you are a leader of many or a leader of one (yourself), creativity is important. Even back in 2010 it was important. By the way, the article has a bunch of interesting nuggets… what they thought about “integrity”, what they thought about global business, etc. Check it out. The second why the article stuck out was because for years my two favorite “c” words are creativity and curiosity. I wrote a blog post about this, but I can’t find it right now. However, here’s some quotes from me on Forbes where I talk about creativity and curiosity, again from 2010: The Seven Most Universal Job Skills. It was then that I learned that creativity doesn’t mean being an artist. I learned that we can all create, and that we can all think creatively. Furthermore, I’ve thought a lot over the years about how much we create vs. how much we consume. I am concerned that we live in a society that is hyper-focused on consumption, which takes the time that we could otherwise produce (or create). I’m not saying we can’t relax, and we have to always create… but I think we are here on this third rock from the sun for a bigger purpose than to just binge watch Netflix and Hulu our entire life. 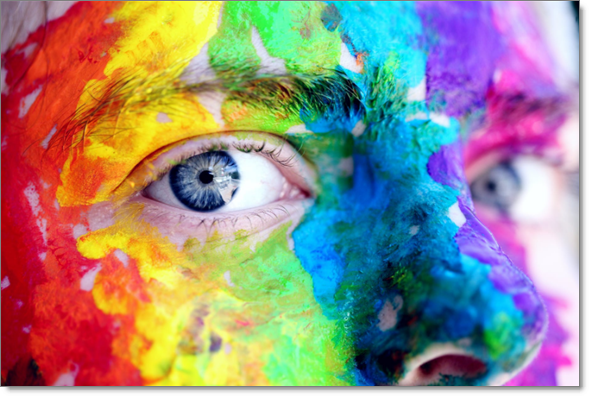 How can you make creativity a part of your brand? This is kind of sad. I know what Patricia is saying because I, too, did things and had credentials that seemed to make me employable. I was told there were certain things to do to further my career, and I did them. When I went into my first real (and unplanned) job search, none of what I did had mattered. My CIS degree didn’t matter, even though it was technical (“not technical enough”). My MBA didn’t matter (MBA means “more bad answers”). The fact that I had recently been fluent in Spanish didn’t matter, because the roles I was looking at didn’t care one iota. My past titles didn’t matter, either because they were at a very small company or because the titles I was going for weren’t related enough. Let me seemingly tangent with something I learned as a speaker. This is Speaker 101 level material: know your audience. I may speak to two different groups on the very same topic, with the very same presentation title, but give two completely different presentations, because the audience is different. How is this “know your audience” topic different than preparing for a career? I took generic, general career advice and applied it to my future without really even thinking about what I was doing. The building blocks I was accumulating was almost in name only. I was not recognizing the raw skills that I should have been focusing on, instead going after titles and credentials. I assumed (oops, bad on me!) that if you saw a title or a credential, you would understand what went into achieving that title or credential. I didn’t need to tell you everything that got me there, or kept me there, or made me successful, if you could just see my accomplishments on my resume. That was a very poor assumption. Looking at Patricia’s comment above, if you think about it you can probably take ten minutes and brainstorm what it takes to get a PhD. The massive amount of research, creativity, working within a very structured organization (but with enough ambiguity that you need to be creative and take initiative), etc. Presenting, writing, analyzing, persuading, researching, … what else? You could take ten minutes each and figure out the skills required for any of what she mentioned: teaching at universities, working in research firms, and working in a public school system. I feel like 10 minutes of brainstorming might just barely scratch the surface. More than understanding the skills, what about understanding THE VALUE. I want to disconnect titles and credentials from value. I don’t care of if you were president of this or that, I want to know what you did. Here’s an exercise for you (all of you): describe yourself only by the value you bring or create, and not by using any titles or credentials. It’s true that, many times, our experiences and credentials help us get into opportunities. How many jobs that you are qualified for say something like “must have a degree” or “MBA preferred”? Having certain things can help you get in the door. But, the successful hire will be the one who ultimately brings value in their role. I’d rather hire someone with no big past titled-history, who does wonders for my company, than someone who has had all kinds of big titles but can’t seem to make any progress. Personal experience: in my first big job search, in 2006, I didn’t get any jobs (barely any interviews) because of my overqualified titles. I learned to kind of dumb-down my resume a bit, and remove the big titles and just change them from CEO to “manager” (an ego blow, yes, but the right thing to do based on what I was applying for). I was putting my titles in front of my value, and I didn’t understand that. Understand what you bring to the table. How will you help the organization with their objectives? What can you do to move things forward? Don’t go based off your titles, rather your skills and abilities. Figure out how to communicate #1. It can be very difficult talking about ourselves, especially when we feel like we are explaining the obvious. But we must become masters at this type of communication. This is a big part of career management, and because jobs don’t have the “security” that they had a few decades ago, we should find ourselves repeating these messages more and more frequently. This is the new normal, and it’s our job to get great at it. To all of the Patricia’s out there, great job on what you have accomplished. Now, just look at it through a different lens… a career management lens. This should reduce your frustration, and it should help you have much better conversations with your prospects. As a hiring manager I look for two very important things. It is your job to communicate the right message for both of these, but not necessarily at the same time. The first thing I need to know is that you are technically competent for the job. Whether you are a mechanic or a programmer or a teacher or a whatever, I need to know that you can do the job. I need to know you have a minimum breadth and depth of experience and skills. You can communicate that with stats and stories. This is done on a resume and LinkedIn Profile and anywhere else. A super powerful tool is a blog (or Medium articles, or even LinkedIn articles), or perhaps a portfolio. You use the right language (jargon) and can talk about things at a technical level. There comes a point in my evaluation of candidates (aka, job seekers) that I assume that everyone I’ve whittled it down to has the right abilities to do the job. This next thing is the deal breaker. By this point I’m not wondering about whether you can the job or not… I have something more important to decide: will you fit into my team? Understanding that I have three or four or ten or more candidates in front of me, all of which can actually do the job I need to fill, the most important thing becomes which one will be the best hire? Which will fit into my team and culture without disrupting it (I don’t want jerks, and I don’t want a “bull in the china closet”)? Which hire will make me look good with my colleagues and bosses? I’m not saying that I disregard technical abilities at this point… but I’m keenly sensitive to picking someone that I’m going to want to be around for 8+ hours a day for the next few years. How in the world do you communicate that? It’s not all about enthusiasm. And extroverts don’t necessarily have the upper hand. Communicating that you will fit in well can be done through stories, of course. Share, for example, a time when you had a very challenging task or project that could have exploded/imploded… and how the team pulled together (and your role in that). Show you will fit in by your choice of language, and the way you treat people (interview at a restaurant? Be cool and kind to the servers!). Recognize that every single thing you do, that I or my team can observe, is part of the interview: how you walk in, how you treat people at the front desk, what you do in the waiting area, etc. So there you go… you have two important things to communicate: one is that you can do the job, the other is that I will want you to be on my team! Work on your communication so I can know that you are the right person to hire! Today I had a coaching session with a very smart Silicon Valley professional. He asked about the value of doing a 360 Review, and as we talked about I realized there were at least three great reasons to do it (more than the obvious, surface-level reasons). I’m assuming you know a 360 Review is where you send a bunch of questions, about you, to different categories of people. Imagine you are in the middle of your contacts, and above you are your bosses, below you are the people who report to you, to one side you have your peers and colleagues, and to the other side you have customers. These four groups of people are in a circle around you, hence the “360”. You can, of course, figure out other types of relationships, including your family, etc. So, what are the three great reasons to do a 360 Review? Especially considering you have to have thick skin because of some of the feedback you might get (if your questions are good and people are honest!). The 360 will have two parts: the introduction, or The Ask, and the actual questions. I should note that a really good 360 will give the person who responds anonymity. This really can only happen if you use a 360 tool (not too hard to find) instead of just asking them to reply to questions via email. How would you describe Jason’s communication skills? What are Jason’s communication strengths? What are Jason’s communication weaknesses? What would make Jason a better leader? What three things does Jason need to improve? Those are just off the top of my head… my point is, ask direct, specific questions that (1) can give you real and helpful feedback (2) on topics that are important. The whole point of this blog post is to talk about benefits that are beyond the obvious surface-level benefits of doing a 360. The benefit spending time to craft a proper introduction is that you get a more solid idea of what you are after (your goals), and how to frame them (communication that you can repurpose in other situations). There is immense value in clarifying and practicing this!! The benefit you get in creating great questions is that you get a serious chance to evaluate yourself, perhaps deeper than you normally are (and without beating yourself up). Thinking through those questions should be a therapeutic exercise and, again, a preparation for interviews and networking conversations. The reason 360s are so valuable is simple: we have assumptions about our strengths or weaknesses that might not be accurate. Who better to give us a more real perspective than people we work with and around? As important, the perspective we get, even if they are wrong, is super important. By this I mean that sometimes people might have a wrong impression, but their impression might be shared with others. Here’s an example: Let’s say I am a super great at doing my job… but I’m a horrible communicator and very impatient with people. I might be the best person in the world at performing the functions of my role, but because I’m such a cruddy person around others, no one wants to work with me. Therefore, no one knows that I’m actually good at something, they just know I’m a jerk. This information comes out in the 360. I want to help people understand that I really am good at what I do. There are many tactics I can employ to help reinforce a strong and accurate and relevant personal brand… I’m not going to go into that in this post. I also want to figure out how to stop being such a jerk. Sure, I’m awesome, but if no one wants to work with me, or wants me to be around, then what’s the point? It’s not like I’m going to have a career like House (the doctor on TV) had… super good at medicine, but everyone hated him. It’s unlikely that you’ll get many chances to have a career like his. So, take the information you get and really work on the feedback. If this sounds hard, it is. You have to face some harsh realities, and do things you haven’t done before. It might mean joining Toastmasters or the National Speaker’s Association. It might mean you work on active listening, or getting better at contributing in team meetings. When people give you anything to work on, let me encourage you to embrace the feedback and work on getting better. I’ve read a lot of articles lately about soft skills and emotional intelligence… this is what people say they can’t “train” you on. Work on it yourself, right now, and through the end of your career! You now get to share your career ambitions and intentions with others. This is tied into #1 above, where you have a great introduction, but it goes a little further. Look, you need to realize that most of your colleagues know you by what you do. If you are a software engineer, people think of you as… surprise! A software engineer! It’s pretty simple. You are branded by how people perceive you, including what your title is. But if you are a software engineer now with strong intentions of becoming a CIO, CTO, or VP of IT or Development, will people realize that? No one might even think of you as an executive, a strategist, a visionary, a leader, a manager! Even though you might be those things, or have the capacity to do those things, they just know you as someone who pounds at a keyboard all day long, creating cool stuff. How do you get around this branding? By communicating the brand changes! Yes, you are a technologist… and a great one! You also are very interested in taking your career to the next level. Tell people this when you invite them to respond to the 360. Tell everyone… whether you invite them to respond to a 360 or not. One of the easiest ways to manage your personal brand is to communicate how you want others to perceive you. So use this activity as an opportunity to do just that. The 360 is a great tool. I hope the ideas here will help you advance your career! Yesterday I went to a network meeting with product managers, project managers, and software developers interested in product. It was really cool and I learned a lot. It’s not the best software that wins… it’s the marketing. Those weren’t his exact words, but it’s the spirit of what he said… and he is right. There was a point where JibberJobber had I think three competitors who had much better packaging of their websites than we did. Our look was outdated and clunky (JibberJobber is developed by programmers, not designers), and our competition had sites that were gorgeous. Beautiful. Years ahead of what we had. Because even though their sites were beautiful, they weren’t very functional. They didn’t have the breadth or depth of features that we have. They were pretty but superficial. But I still had users who said “I’m going over to their site because they look better.” No kidding… that’s what people said. We’re still around, and we’re working on looking better… but we’ll always put function over beauty because our users want and need function. How does this relate to the job search? I’ll not beat around the bush on this: people who present themselves better are more likely to get the job. That could be visual appearance, the refinement of your marketing pitches, your accent (sorry, but people judge), your hair, the car you drive, the clothes you where, and even if you misbuttoned your shirt. You might be the most brilliant expert in your field, but if you are unknown (poor personal branding) or have bad packaging (your personal marketing), you might get overlooked for someone who presents themselves better. To related that to the bold line above, your abilities are the software, but your presentation is the marketing. And you can’t ignore the marketing just because you think the software is better. That’s just the simple human nature that marketers have been tapping into for centuries. So yeah, sharpen your saw and get better at your craft, but get serious about your personal branding and marketing and presentation. I was really introduced to the concept of the 30 second pitch at the first job club I went to. Don’t get me wrong… I had heard about it before. But this was the first time I really had to (a) come up with my own, that was relevant, and (b) practice using it multiple times. Doing either of those, especially (b), is a lot harder than just pontificating about your elevator pitch in a college classroom. Alas, I did it. We did it. All of us job seekers put together our own elevator pitches. And it was hard. It was hard to come up with something about ourselves, and frankly it was hard to listen to all of the horrible pitches. The focus became memorizing a bad pitch, and not thinking too much about the pitch as a tool, and the purpose of the pitch. I thought about how horrible it was to sit through a bunch of crummy elevator pitches. Why was it so hard? What a great question. When a job seeker shares the elevator pitch they created with another job seeker, it’s usually the wrong message for that person. It might be the RIGHT message for an interviewer… so I guess it’s good to practice that pitch. But let me encourage you to think like a marketer and know your audience. Is your message aligned with your audience? Now, I just spent two minutes on both of those… if I worked on it longer I’d come up with tighter messaging. My point, though, is that you MUST KNOW YOUR AUDIENCE. Maybe elevator pitches stink so much because we are simply giving the wrong pitch at the wrong time to the wrong person. If we know our audience, and they become the right person, we can adjust our marketing message with them. Don’t go on autopilot, lest you might just regurgitate stuff that makes no sense to them. By now I’ve been to two of those countries (UK and France), and soon will be in Italy. 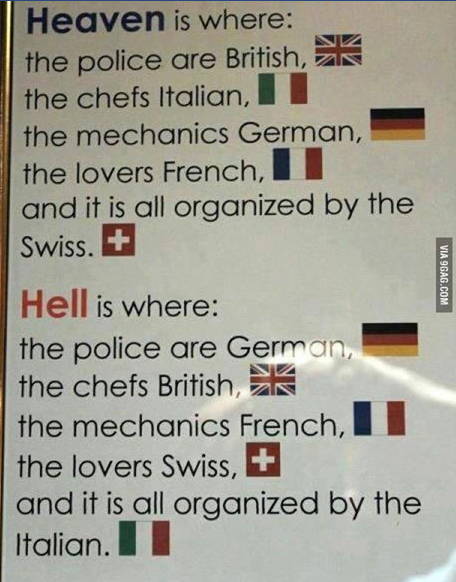 I don’t know if those are really true… we’ve had some excellent food in England! But the point is, stereotypes! Stereotypes don’t have to be true to ring true, or to be powerful or persuasive. You have to figure out what stereotypes you are stuck with, or should fight, and then create a strategy to fight them! I like focusing on a primary claim because I think too many job seekers… well, pretty much everyone, including marketing professionals for companies, don’t narrow down to the main, primary thing. We are afraid of getting too specific, lest we leave something out of our marketing message. What if we narrow our message down and exclude people who would otherwise hire us, or pay us money? Better to just give the entire list of our offerings, or claims, right? I challenge you, like I challenge the people I do a LinkedIn session with, to figure out what your PRIMARY claim is. If you had to narrow it down to one phrase, or tagline, what would it be? You can tell your story, and help people understand your breadth and depth, with what I’ll call secondary claims (and some other techniques/tools), but make sure you understand and communicate your primary claim. Understanding your primary claim makes it easier for you to communicate what you need to in interviews, while networking, and on your marketing documents (resume, profiles, etc.). Communicating your primary claim well makes it easier to know how to talk about you. This is a profound concept. If you can communicate your primary claim well, the people on the receiving in can know how to communicate about you. If you don’t know what your primary (or secondary) claims are, how in the world are they going to talk about you the right way? Don’t rely on luck when it comes to your branding. 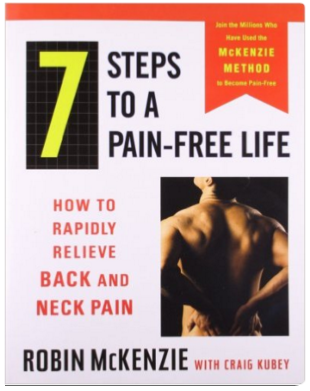 This book has a lot of steps you can follow to have less pain (or, be pain-free). It’s very feature-rich. But the reason I’m reading it, and the reason people bought it, is not for the features. I started reading this book because of the BENEFIT. Sure, I want to understand the dynamics of my neck and back, and how they all work. Sure, I want to learn some exercises that will be beneficial, but neither of those are the reasons I’m reading this book. I’m reading this book because I want to be pain-free. There is hope, according to the title, and the introduction, that the pain I experience can actually go away, forever. My first exposure to the McKenzie Method was around 15 years ago, when a doctor referred me to a physical therapist who was a McKenzie Method guy. To be honest, this was the most intriguing and honest medical consultation I’ve ever had. Without going into our first meeting, and the next few weeks, I’ll just say that the results were amazing. What I learned about my back, and one specific problem (pain), was enough to help me go through the rest of my life to avoid or fix that pain. Recently, I’ve been experiencing a different pain in a different place, and it’s time to dive deeper into some other exercises, and knowledge about the root issues of my pain. This is all about HOPE. Sometimes, I am hopeless that I’ll live a pain-free life. But this book promises me hope. Switching gears to YOU, I wonder what you promise your future company. Is it that you can do A faster, B better, and C cleaner than anyone else? Is it that you are smart and have high integrity? Those are all great, and important, things. But in reality, you bring HOPE to the employer. Hope that they will make more money, or save more money, or that Headache A or Wildest Dream B will actually come true. When I hired my last developer, I did it because I want to make serious and major progress in JibberJobber. Not because I want more lines of code written, but because I want to offer more value to my users, and help people get onboarded with JibberJobber better (that’s been one of my headaches for years). She will help with that. I don’t know how many lines of code she’ll add (or remove), but I do know she’ll help us get closer to achieving our goals of delighting people who sign up and get started with JibberJobber. She has given me an added measure of HOPE. And that is one of the most powerful things she can give me. What HOPE are you communicating in your value proposition?